The Bariatric Guard gel mattress offers the maximum protection against pressure sores and decubitus ulcers. The Bariatric guard gel mattress is Medicare approved and incorporates the best features in gel mattresses on the market today. Our ultra gel liquid is distributed evenly through 15 sectioned bladders, more than standard gel mattresses. Each bladder is engineered to redistribute the pressure to relieve painful pressure points. The bariatric gel mattress is constructed using a high-density foam base that secures the gel bladders in place for maximum weight distribution and durability. The bariatric gel mattress is covered using a combination of two fabrics. The top cover is a soft non-shear nylon that reduces heat, friction, and moisture build up to prevent minor skin breakdown. 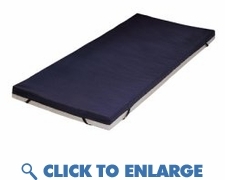 The base of the mattress cover is a durable medical grade anti-skid vinyl with flexible nylon corner straps. The cover is fluid and stain resistant, anti microbial, and fire retardant.